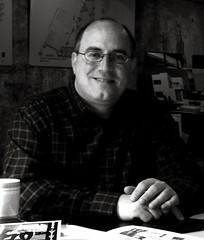 Portrait taken in July 2005 in the studio of Raimist architecture, Inc. Seeing as I'm still learning how to develop this blog and don't yet have a handle on creating links along the margins of the page, I'd like to mention some of the websites and blogs that have directed people (directly or indirectly) to my blog. ~ one of the blogs by Saint Louis' own Toby Weiss (a woman of many talents): B.E.L.T. ~ Thanks to Bill Keaggy (St. Louis Post-Dispatch Feature Photos Editor) who mentioned us on his blog (bits) by bill keaggy as well as including it in the St. Louis Post-Dispatch under the heading "A Site to Behold". ~ Chicago's Tim John Hill (architect, graduate of KSU): A Daily Dose of Architecture. ~ inclusion in the links section of the Architectural Sketches blog. ~ inclusion in the links section of the Architechnopilia blog (relating to the love of things architectural). ~ the website Annukka of Polish photographer Agata Lenczewska-Madsen. You should also see her photography on Flickr. ~ Kim G.'s website: LivingHome. ~ an entry with images of the Ethical Society in the :: urbansheep :: blog (in Russian), dated 21 October 2005. ~ the entry in the ColumnNetwork.org blog with the Shanley Building along with the quote, "Give me MODERN or give me death". ~ reference to our renovation of the Bergeron/Wellmeier Residence (originally the Vollmer Residence) on the Houseblogs.net site. ~ reference to Armstrong's "The Rockpile" on Archinect.com. Ecology of Absence. I'm also proud to be on their website's useful list of resources: links. ~ London-based magazine included links to this blog on Tuesday 2 August 2005, Tuesday 16 August 2005, and Friday 19 August 2005: ThingsMagazine. ~ for its mention of "The Rockpile": BlogosphereWanderlust.bldg. ~ The LivingHome entry entitled The dashing Harris Armstrong of St. Louis. ~ for its mention of the Magic Chef Building (on 1 Aug 05): Coudal Partnership. also, their endorsement to 'architecture geeks' in their archive. ~ inclusion in the architecture links section of the Architecture blog. ~ from the world's best online photography site Blogs That Flickr. ~ from inclusion in dmoz open directory project. ~ a website searchable for tags like "Armstrong": TagCloud. ~ for inclusion in the photostream section entitled Details of Modern Architecture on Kontent. ~ for inclusion on the blogroll of Pruned. ~ listing on the "A" list of PhotoBlogs. ~ comments on the Bergeron/Wellmeier Residence from JuicyFly.com. ~ Alejandro Rives of Uruguay: Arquitectarte. ~ Saint Louis' own: MB's Blogasm. ~ discussion site re: residential modernism: LottaLiving. ~ site re: modern architecture: Land+Living. ~ Architect and author Sarah Susanka's website Not So Big House. ~ Mother Earth's Mother Earth News. To those involved with the above sites, "Thank you". Andrew - Thanks for the mention, though just wanna let you know it's John Hill, not Tim Hill. Thanks, too for all the other great links to check out.